The 2018 Glass Valley Cemetery Walk was a huge success. About 35 people attended including Patricia Mory from the Pierce County Historical Society. The weather was perfect. 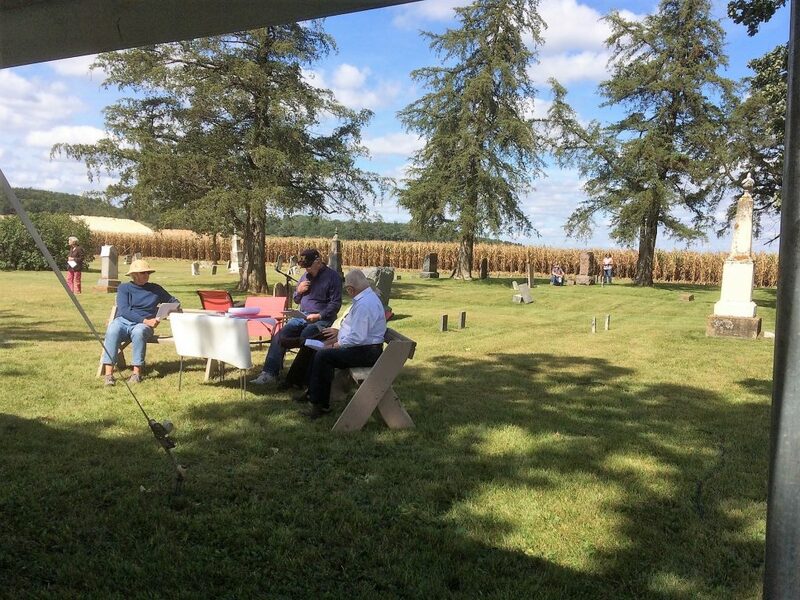 Volunteers read the story of the Webster Family who homesteaded the land and sold one acre for the Cemetery. The attached photo shows Maureen Ash as Polly Webster, Jerome Rodewald as Narrator, Kurt Leichtle (Hidden) as Milton Webster, plus Roy Lund as John Webster. The Town & Country 4-H kids had the Cemetery in tip top shape. For thousands of years, people lived in this area. They built their villages near creeks and streams and fast-flowing small rivers so they'd have a source of water in the winter. They hunted and fished and gathered berries and plants for food and medicine. They were like us—they loved their families and friends and the land where they lived. Just as we have cemeteries, they had places to bury their dead. There are a lot of different theories on this, but one of them is that the Woodland people, also called the Oneota, lived here until about six hundred years ago. They built earthen mounds, which they used as burial grounds. There's one at the confluence of the Kinnickinnic and St. Croix Rivers, just inside Kinnickinnic State Park. It matches a mound in Fairview Cemetery in Stillwater. The Dakota people lived here after the Woodland people moved on. They also used mounds for burial, but they first raised their dead, wrapped tightly in blankets, on scaffolds and left them for up to two years. Enter—Polly Webster: “Oh, for goodness sakes. I didn't know we'd be having company! Well, come on in. Don't bother wiping your feet. I've heard of this cemetery play. It's nice to know you modern folks have the time and energy to think about us. We've been dead for so long! But we were alive once, just as you are, and I for one am glad to be able to tell you a thing or two about what that was like! Milton: “We told that land agent that the laws governing homesteads allowed a woman to own land. I think he wasn't a big reader, or he might have challenged me on it. I was ready to quote chapter and verse to him, though—Section 52, Chapter 102, Revised Statutes of 1849! All it said was that a husband needs the signature of his wife to sell his land, but he didn't need to know that. Narrator: These people were buried on the Webster's land before it was officially a cemetery. Hosea Bates: “Here, here, fellows. Let's call this meeting to order. November 30, 1863, the first meeting of the cemetery association. Narrator: “The cemetery might have been called Greenwood Valley Cemetery, but it wasn't long before people referred to it as Glass Valley Cemetery. The Glass family owned so much of the land in the area, the whole valley took on their name. The association sold their first official lots at that first meeting. They set out rules governing the cemetery, such as how the lots would be arranged and what they would cost. They had it fenced, and they made sure there was a good, strong hitching rack for horses and teams so people wouldn't tie their animals to the fence. The little cemetery absorbed the bodies and the tears of those early settlers. Gradually people began burying their dead elsewhere. The last lot was sold in 1936. Some of the graves were drifted over by dirt during the great Dust Bowl of the thirties. Weeds and sumac took over the cemetery. It became an eyesore. Narrator: “In April of 1948, just two months before the death of Mr Hickok, at age 90, the town of River Falls agreed to take over the cemetery. “Things didn't change right away. But in 1957 the Town and Country 4-H Club took over the maintenance of the cemetery. The young people and their parents worked hard to dig up the sumac roots, encourage the growth of grass, fix the toppled and broken tombstones, and make it a place of respect for the people who were buried there. “The club is still taking responsibility for keeping up the cemetery. It's beautiful to drive past here on a summer evening and see a family or two here, mowing, weeding, or just walking around and looking at the headstones, learning about the history of our area. Thank you, pioneers, and thank you, Town and Country 4-H club.